In a near future, a totalitarian state is ruling England. On November, 5th, a man self-calling V (Hugo Weaving) explodes a symbolic monument and starts fighting for freedom using terrorist technique. He also rescues Evey Hammond (Natalie Portman) from the claws of the abusive secret police and later she becomes her allied. The man in charge of the investigation, Inspector Eric Finch (Stephen Rea), discloses the truth about his leaders while chasing V.
a vividly vivacious and voluptuous volley of a very violently fun time, 14 March 2006 Author: samseescinema from United States V for Vendetta rating: 3.5 out of 4V for Vendetta is a swift and smugly entertaining portrait of revolution. Albeit, this is a Wachowski Brothers revolution, meaning there must be wildly theatric heroes and crisply tailored CGI stunts all set comfortably in an oppressive Totalitarian society. But this is more than The Matrix with a Victorian flare. 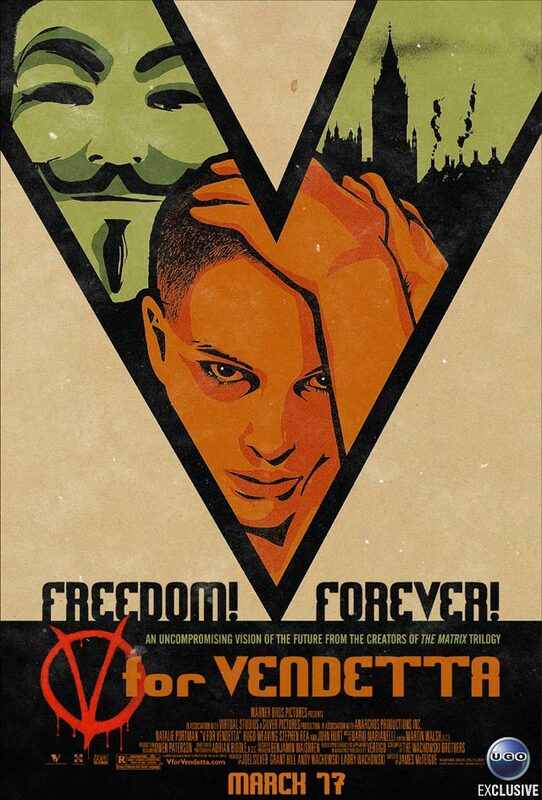 V for Vendetta offers up a convincing vision of the near-future paired with an operatic comic book tale of love, mystery, and a Guy-Fawkes-masked rebellion. 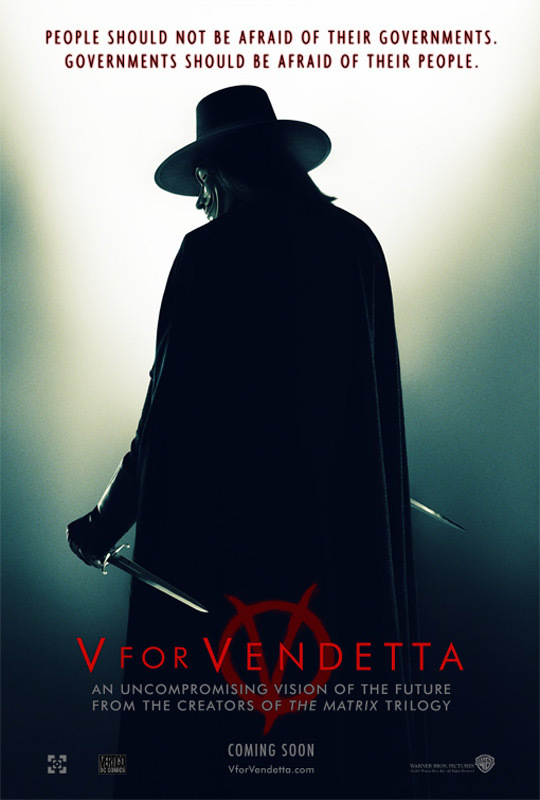 Our hero is V (Hugo Weaving), a masked terrorist with a mind for the subversive, a taste for the eloquent, and a hand for knife-wielding acrobatics. His accidental apprentice (or maybe hostage) is Evey (Natalie Portman), a young woman V saved from the fondling grasps of corrupt Fingermen (kind of the CIA for the V for Vendetta world) as she hurried across town past curfew. Our oppressor in this world is High Chancellor Stutler (John Hurt), whose persona is shown primarily through a five-story tall projection of his ever-angry head. The exposition for this near-future lies mostly in the implosion of America after the middle-eastern war expanded into a world war that reached its tendrils even through Western Europe. America folded into civil strife while Britain became the final bastion of modern civilization after a biological attack isolated the island into a zone of quarantine. Stutler rose to power in the chaos and now rules Britain with the mantra "England Prevails!" Rest assured, however, this is not a reality governed by rolling robots and giant overhead blimps, it',s a world that',s, instead, very similar to ours. The technological innovations are hidden subtly into the film',s environment, refusing to take precedent over the historically opulent flavors of England',s architecture. 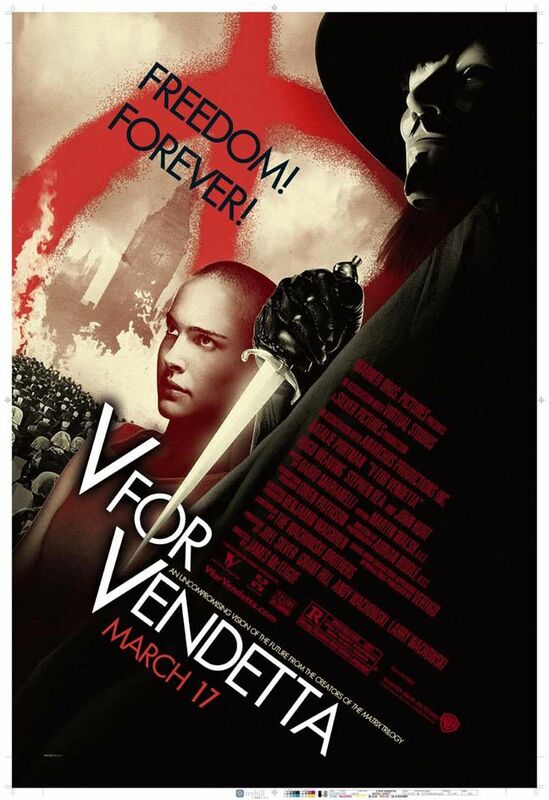 V for Vendetta has a flare for the theatric and operatic, after all. There',s no room for bleeping robots and bounding technology. 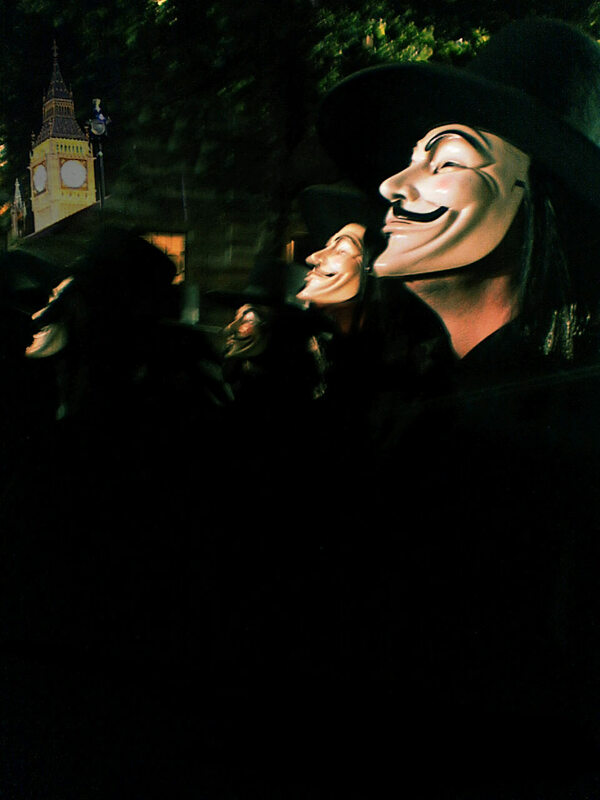 On the eve of November 5th, when Britain traditionally celebrated freedom and truth, V launches a subversive plot to topple High Chancellor Stutler and his surrounding administration. Hijacking the British Television Network, he broadcasts a speech that sets the date one year from November 5th as the date of the revolution. Our story takes place in the interim year leading up to the supposed revolution, with the evolution of Evey',s politics, the ongoing vendetta V has set against the players of a mysterious government plot, and the deepening hole V digs for Stutler and his boys to stumble into once that fateful date arrives. "Remember, remember the fifth of November." 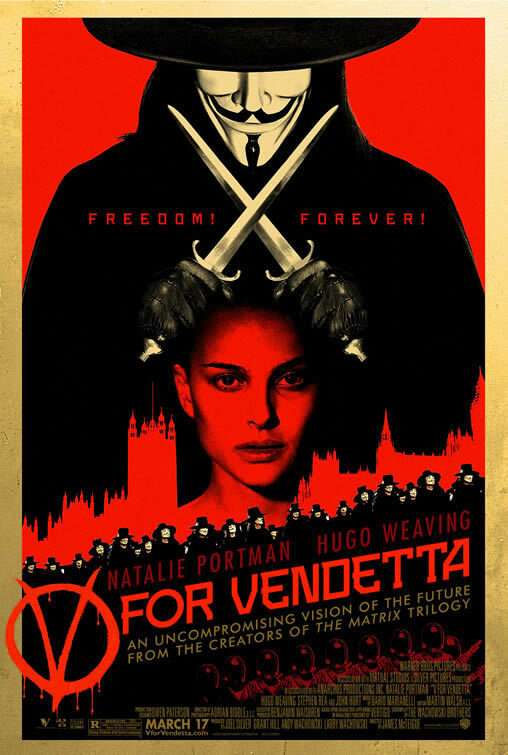 What separates V',s rebellion from the teeming hordes of other cinematic coupe d',etats made over the years is that V for Vendetta approaches the topic with one eye held straight at the politics of the present. Hot button headline topics continually rear their heads here. Bush is paralleled to Stutler, the news media is heavily clouded, our hero is paired with images of suicide bombers and subway attacks, not to mention the undeniable fact that we are asked to sympathize with an outright terrorist. Is terrorism justified when paired against a strict oppressor? In the political climate of today--where the title of terrorism is threatening to mirror the clout McCarthy granted the title of Communism--V for Vendetta',s answer to that question is a sure-handed yes. 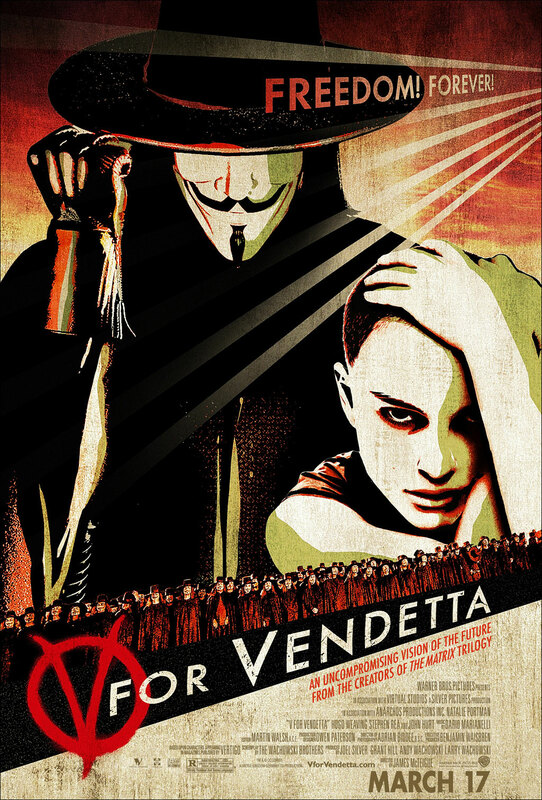 But V for Vendetta is no heavy-handed political allegory. 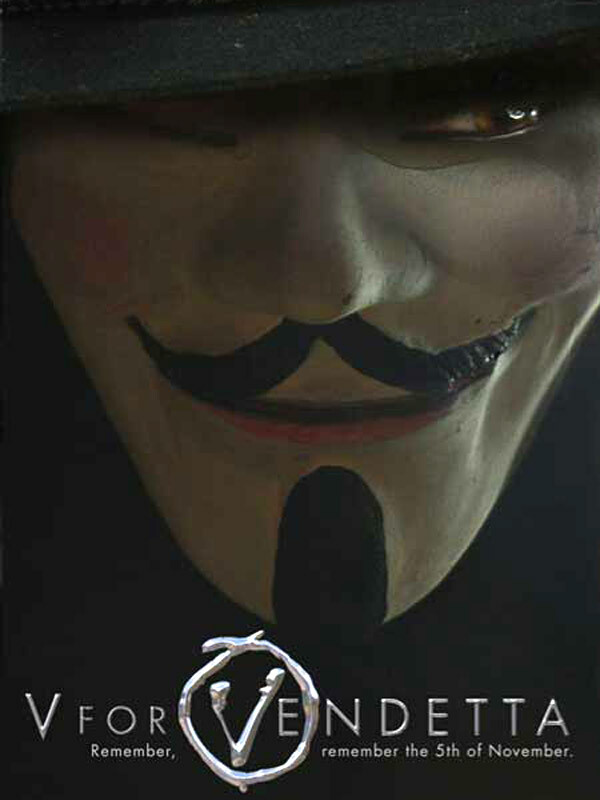 At its heart, V for Vendetta is entertainment. And as any entertainment with a hand in Victorian elegance, V for Vendetta must have romance. But before you conjure images of the Fawkes mask flying in a sweaty bald-headed scene of lust, realize first that there also is a master-grasshopper dynamic between Evey and V. The romance is formed as an understatement and rarely addressed, let to simmer below the surface and lend more chemistry to scenes that would otherwise ring hollow.Natalie Portman may have stolen the tabloid exposure with her shiny shaved head, but Hugo Weaving is the masked performance that steals the show. 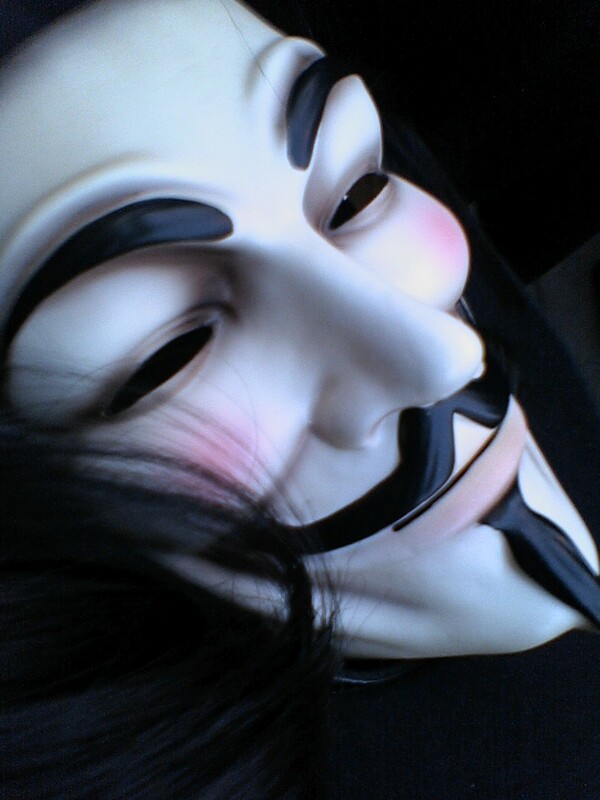 Much of the role',s success lies in the writing, for V is made not to be simply a mask. There',s a theme throughout the film asking whether behind masks of revolution, there lie fighting men and women, or only their ideals. V answers this question with charisma. Contradicting the common mantra that masked figures must be laconic, V, in fact, probably has the most lines of all. The character is full and rich with quirks and personality, but still exists with that essential air of mystery. Weaving achieves the same level of iconic performance that he did with Agent Smith in The Matrix. It really is that good.There',s been debate over the quality of adaptation the Wachowski Brothers offered to Alan Moore',s original graphic novel. Moore has publicly separated himself from the film, quoting in the New York Times last week that "the screenplay',s rubbish." Well, before we all walk away from the ticket line, remember primly that Alan Moore will be the first to tell you himself that he is a selfish, pretentious prick. He knows it, and we know it. Let',s move on. The screenplay',s fine. In fact, it',s a near-masterpiece. What the Wachowski Brothers have done is find the right balance between the theatrics of the graphic novel, and the solemnity to the richly Victorian narrative. They form a dynamic that plays to both sides, allowing for a story that sparks both political debate and giddy entertainment. We',ll first shake our heads at the sentimental, soft-focus flashbacks and silly sub-plot for "nuclear human experimentation", but when mulled over, we realize it',s just the comic book mentality showing its spots. After all, V wouldn',t start all his sentences with v-words had this film shunned its comic roots. 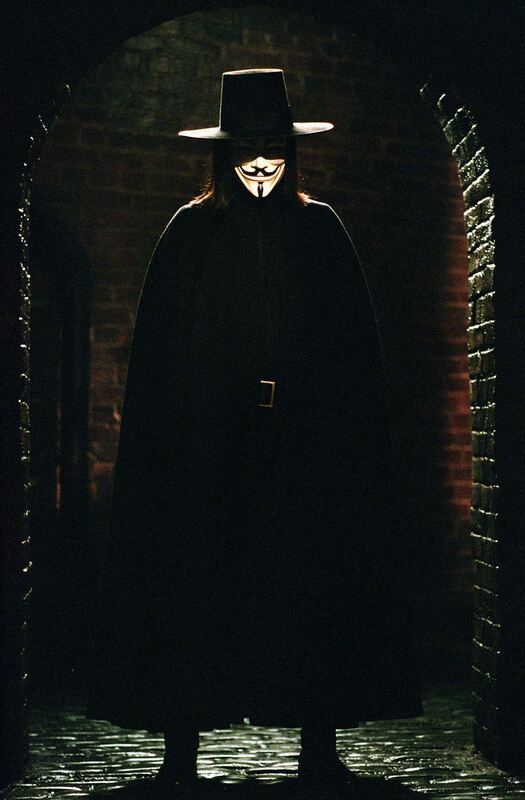 And anyway, V for Vendetta is a vividly vivacious and voluptuous volley of a very violently fun time.